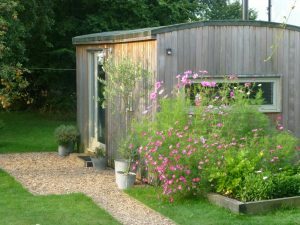 Here are just a few of the commissions and bespoke pieces Alice has undertaken over the last 10 years. Most come and go too quickly to be photographed. To discuss a commission or remodelling a piece then please make an appointment to visit Alice in the studio. 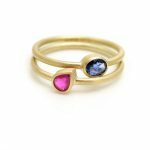 These gorgeous tiny 18ct gold delicate rings are made with recycled 18ct gold and have tiny precious stones set at different angles. They look great worn separately or together. 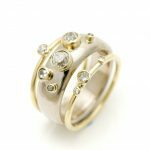 Why not commission a pair of rings made with your favourite stones or birthstones and recycling gold from unworn pieces. These are designed for wearing on your little finger. Prices start at £325. 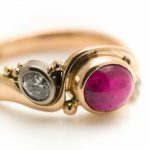 Shown here with a drop shaped pink Ruby and an oval Sapphire. 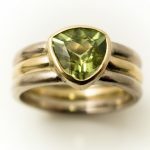 This gorgeous green Tourmaline was sourced by Alice and made for a client who liked the mix of white and yellow gold. 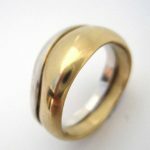 Set in 18ct yellow gold with the addition of two white gold narrow bands set on either side of the central band, this is an unusual and contemporary ring. 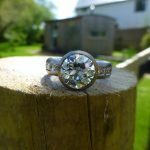 If you would like to commission a similar ring then please contact Alice using the contact form in the main menu. 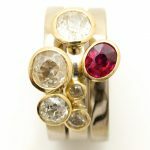 Based on the high stacking ring sets in Alice's ring collection this commission uses a variety of Diamonds and a Ruby from an unworn inherited piece of jewellery, set in 18ct yellow gold with 18ct white gold bands. This stacking set again uses a mix of different coloured golds much favoured in Alice's collections. 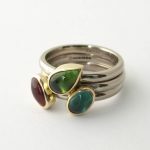 If you are interested in commissioning a similar set of rings using your own stones or those sourced by Alice, then please contact her using the contact form in the main menu. A commission based on my popular silver stacking rings. This set of stacking rings are made using 18ct white gold for the ring bases and 18ct yellow gold for the stone settings. The Tourmaline stones are three complimentary colours and shapes that sit snuggly together. If you are interested in having a similar set of rings made please contact Alice using the contact form in the main menu. This 18ct Rose gold ruby and diamond ring was a bespoke design for an engagement ring. 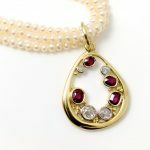 We started with the beautiful oval cabochon ruby and trying to incorporate the sea and pebbles as inspiration for the design. Alice is happy to work with you to design a unique piece for any special occasion. To discuss a commission please contact Alice using the contact form. One of my original commissions that is still much admired! Designed for a 10th wedding anniversary, this 18ct white gold eternity ring has 10 diamonds (of varying sizes) set in a continuous suspended central wave. If you are interested in commissioning a similar ring please contact Alice using the contact form in the main menu. This commission used a clients 'old cut' diamonds set in 18ct yellow gold on a wide 18ct white gold ring base. With the addition of two narrow 18ct yellow gold bands this contemporary ring made use of diamonds from an unworn inherited piece. If you are interested in having a similar piece made using your own stones or ones sourced by Alice please contact her using the contact form in the main menu. Designed for a client based around stones taken from an unworn inherited piece of jewellery. The pendant is made from 18ct yellow gold with 8 rub over settings and random 18ct gold granules all set within a misshapen oval pendant. 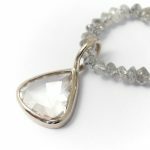 If you would like to commission a bespoke design using stones from an inherited or unworn piece of jewellery please contact Alice using the contact form in the main menu. A commission for a 70th birthday present. Once you've seen them in the flesh, there really is nothing quite so special as a diamond bead necklace! Commissioned here with a rosecut drop shaped 1ct diamond set in 18ct white gold. There is a similar diamond necklace with a grey drop diamond pendant available to purchase from the studio. For further information go to 'Diamond bead necklace' within the Wedding category or contact Alice using the contact form in the main menu. This beautiful and very large diamond was set in 18ct white gold with 6 additional graduating diamonds channel set on each side of the stone. A commissioned piece using the clients Diamonds. If you would like to commission a similar piece using your own stone or one sourced by Alice please contact her using the contact form in the main menu. This gold and silver wave ring uses contrasting metals, in this case 18ct yellow gold and silver, to form an interesting and simple contemporary ring. Available in different metal combinations. 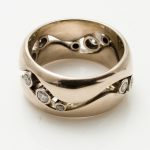 If you are interested in ordering this ring please contact Alice using the contact form in the main menu. This green Amethyst and Rhodelite Garnet necklace was made and donated as first prize for the St Michael's Hospice 25th Anniversary Ball in 2012. 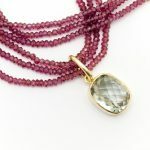 The combination of the beautiful cushion shaped green Amethyst (also known as Praisalite) set in 18ct yellow gold with the 3 rows of pink Rhodelite Garnet beads, make this a truly stunning necklace. The lucky prize winner has contacted me recently to say how much she wears and treasures this necklace. A similar piece is available to purchase with a silver setting. Go to 'Necklaces/Pendants' or 'Wedding' within 'Collections' to view the silver version, Praisalite and Garnet Necklace.